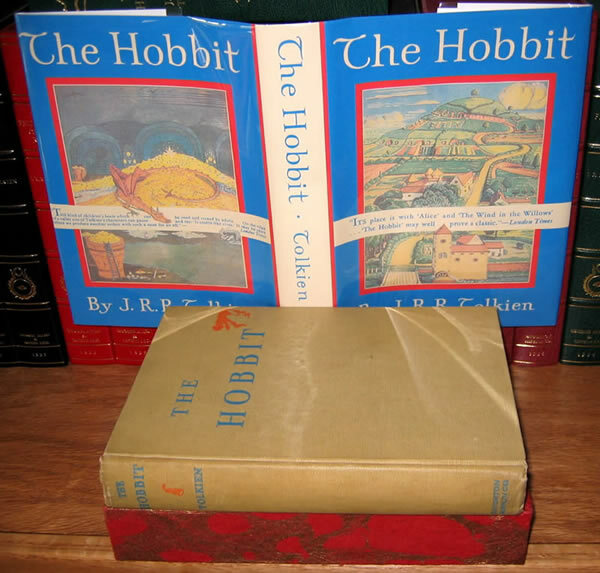 The first American edition of The Hobbit (Hammond & Anderson [A3b]) was published by Houghton-Mifflin in 1938, one year after the British edition. It is significally different from the UK edition, lacking the Britisch jacket Tolkien designed in favor for a more 'american' jacket. Yet, the first US edition is one of the most beautifully designed of the early editions of the Hobbit. Houghton Mifflin chose to print it in a little larger size and on heavier stock than Allen & Unwin's first edition, and they chose for the inclusion of four of Tolkien's color plates. While the first British edition does have none at all. The margins are ample and the typesetting iswell crafted for readability. The tan cloth cover is printed in blue for lettering and red for the bowing hobbit emblem on the front and the dwarf's hood emblem on the spine. One minor point is that Houghton-Mifflin chose to print the end-paper maps in red only, instead of the black and red chosen by Allen & Unwin, wich is clearly more attractive and beautifull. 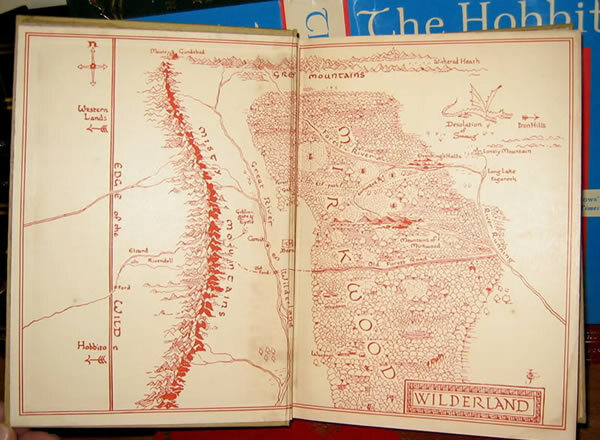 The American publishers also mistakenly put the Wilderland map in front and the Lonely Mountain map in back, the reverse of the description in the text. Chapter VII (Out of the Frying Pan) is incorrectly identified as 'Chapter VI' in the first state. There are four primary 'states' of the first American printing. 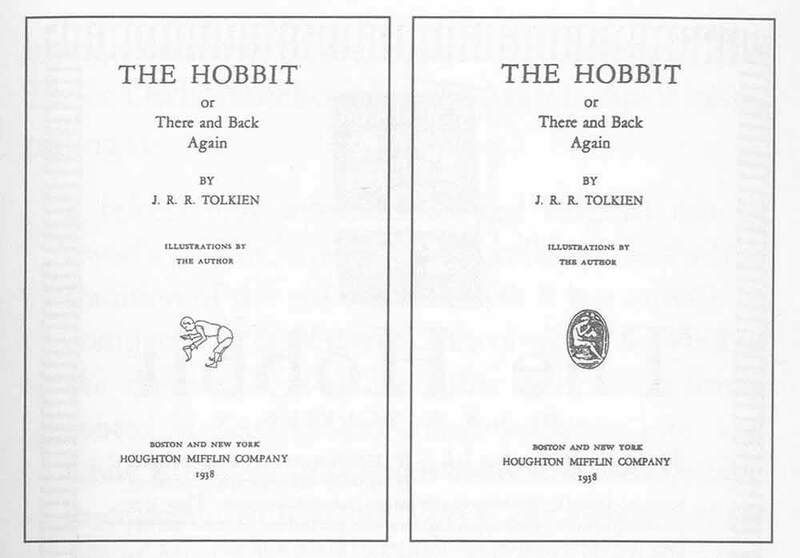 The earlier state, at least 3000 copies, shows on the title page the same bowing hobbit emblem visible on the cover. The second state of the first impression, being 5000 copies, is characterized by the replacement of the bowing hobbit with the Houghton-Mifflin device of a seated flute player. The boots the hobbit wears in the emblem were acknowledged to conflict with the text's description of a bare-footed hobbit, so the publisher replaced the emblem with the rather less appealing seated flautist. Another possibility for the change is told, namingly the stamp for the bowing hobbit had broken and there for switched. The first story seems more logic. Whether one calls this development a variant state or a second printing is been a discussion for a long time now. 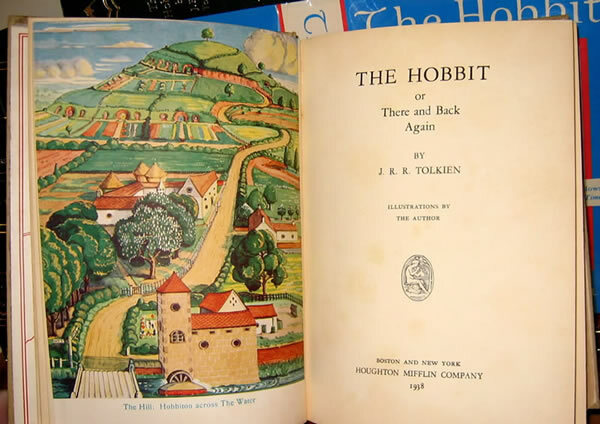 All of the first edition Hobbit printings have the 1938 date on the title page, so researchers have been hesitant to ascribe different printings to them. Others reason, however, that Houghton Mifflin printed the volumes several distinct times between 1938 and the second edition of 1951. As evidence, each of the variations described in the preceding paragraph could not have come about during the course of a single printing run. Also, thirteen years elapsed between the first printing and the appearance of the second edition; it seems improbable that Houghton Mifflin would not have reprinted the book (presuming the arrangements with Allen & Unwin permitted). And finally, while the bowing hobbit (first printing) version appears on the market uncommonly, first editions as a whole show up scarcely less often than all the printings of the second edition. * First state: Bowing hobbit emblem on title page. Chapter VII mistakenly titled Chapter VI. Maps pasted down. * Second state: Seated flautist emblem on title page. Chapter VII mistakenly titled Chapter VI. Maps pasted down. * Third state: Seated flautist emblem on title page. Chapter VII title corrected. Maps pasted down. * Fourth state: Seated flautist emblem on title page. Chapter VII title corrected. Maps become free leaves. All the states of the first edition measure 15.0 x 21.0 cm and contain 310 numbered pages. The dust jacket on the first edition is extremely rare. It is a medium blue field all around. 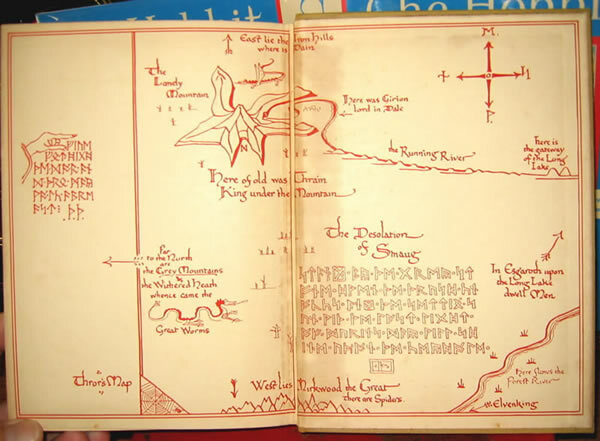 The front announces the title in white, beneath which appears, in color and framed in red, Tolkien's illustration of Hobbiton. The reverse displays Tolkien's illustration of Smaug on his trove, also in color. If the jacket is intact it show the price of $2.50. Prices of the American edition tend to lag those of the British because they are not considered 'original'. The first state catches exceedingly more money then the second, third and fourth state. The presence of the matching dust jacket often doubles or even triples the value of any of these states, particularly if it is in good shape and unrestored. The first edition, with its very different account of Riddles in the Dark, is in great demand these days. Which is raising the price a lot. A second state first edition can be found for around $1000, when lacking the jacket. With the jacket it already costs around $4.500. The first state jacketless around that price and the first state with jacket can be found from $ 5.000; Yet be ready to pay more when you want a very nice and clean copy. A clean and perfect jacket is almost never to be found on the market. It is not known whether that is because of attrition or because some printings were not jacketed or because lots directed to some markets did not come with jackets. J.R.R. Tolkien: A Descriptive Bibliography by Wayne G. Hammond, with the assistance of Douglas A. Anderson. J.R.R. Tolkien: The Annotated Hobbit, annotated by Douglas A. Anderson. Identifying HMCo Editions of The Hobbit, From Wikipedia, the free encyclopedia.